The skin is the body's primary line of defense against infection. There are three common layers to the skin - Epidermis, Dermis and Hypodermis, composed of skin cells, capillaries, sweat glands, and hair follicles. Common skin diseases often occur in the two uppermost layers, the epidermis and the dermis. Uncomplicated skin diseases are easily cured because the skin generally sheds after a couple of days, but more complicated skin diseases are rooted at the hypodermis level and these are more difficult to cure. Some skin diseases are rendered incurable and only subject to remission and exacerbation; that is, they remain idle on occasions and flare up from time to time. Leech Therapy or Hirudotherapy has been practiced for centuries and is still widely used today. Although there is not much documentation available, leech therapy is still well accepted in many parts of the world. Hirudotherapy is the use of medical leeches for the treatment of a variety of diseases. 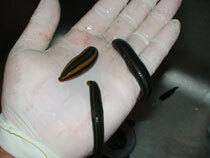 Each leech can absorb a small amount of blood, no more than 10 to 15 ml at a time and, as such, several leeches are used during each therapeutic session. According to many ancient beliefs, Hirudotherapy is included in the five bio-purificatory procedures that are based on the belief that the removal of unclean and impure blood treats the root of all sufferings. About 100 hairs are naturally lost from the head every day, though the average human scalp contains between 100,000 and 150,000 hairs. Genetic baldness is caused by the body's failure to produce sufficient new hairs, not by excessive hair loss. It affects men more than women, although women also can develop a characteristic pattern of hair loss. About one quarter of men have started balding by the time they are thirty, and about two thirds are either bald or are balding by 60. Leech therapy is not generally associated with treating alopecia, but is very effective nonetheless. Blood circulation improves as a result and the body's natural defense against fungal infection can once again be delivered to the affected areas, thereby promoting healing. Boils are infections deep in the skin. A boil begins as a red area and gradually becomes tender and firm. An 'eye' forms at the center and contains yellow fluid called pus, which is composed of white blood cells, dead bacteria and proteins. The extent of the disease can vary from a few tiny lesions here and there on the body, but are most commonly seen on knees, elbows, the chest and scalp, appearing as red, scaly patches that reveal fine silvery scales when scraped or scratched and often itch and feel uncomfortable. This condition can cause sufferers to become withdrawn and uncomfortable in forming relationships because of the way people react to the appearance of their skin. Why psoriasis occurs is unknown, which makes it quite impossible to prevent. However, many things are thought to trigger the condition, including skin injury, sore throats/chest infections, some drug treatments, sunburn and even stress. As hopeless as it all may sound, ancient doctors have been using Hirudotherapy to improve the outcome of skin diseases like psoriasis. Not only are leeches useful for sucking pooled blood, their saliva also contains active substances that are bactericidal [fights off bacteria that proliferates over thick layers of excess skin cells]. Other substances in the leech’s saliva also cause gradual slowing of skin cell production, giving noticeable relief for patients.